Buy One Course Get One Course Free! 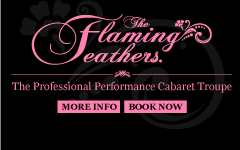 *Feather Fan Dancing Course 6pm at Studio 5, Kingswood Estate Bristol, Commencing Thursday 16th April. *Moulin Rouge Dance Course 7pm at Studio 5, Kingswood Estate Bristol, Commencing Thursday 16th April. LIMITED PLACES AVAILABLE ON THIS OFFER!